Assure application quality, reliability and predictability. Immediately under-performing components, functional defects or bottlenecks with CitraTest! Your job as a QA professional has never been so challenging. Applications are distributed across remote offices, datacenters and cloud locations; they utilize heterogeneous technologies, and they can be legacy, packaged, or custom-built. Furthermore new Agile and DevOps methodologies have increased the velocity of release cycles, and drastically shortened testing cycles, so test automation is a must. Purchasing separate test automation tools for each application is too expensive, while learning and configuring multiple scripting languages will severely slow you down. Instead, arm your QA department with one powerful and intuitive test automation solution for EVERY application. Accelerate time to market with CitraTest! Complete QA coverage with one license: Learn, set-up and configure ONE solution for all your test requirements (functional, regression, performance, and latency). Support for ALL applications (Java, .NET, Citrix, Microsoft Terminal Server, Terminal Emulation Mode, SAP, Epic, Cerner….) All you need is access from a Windows client to the target application to start testing and validation. Point-and-click scripting wizard. Easily automate all user actions (clicking on, comparing, verifying, awaiting display images…) with no efforts, no scripting skills required. CitraTest® even automates keystrokes in the same way that a user types on the keyboard. Test real end-user experience: Generate real mouse activity and keyboard strokes and then test, measure and validate the images on the screen - just like a real user. 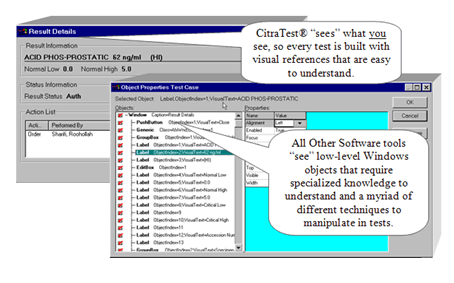 CitraTest® will 'look' at the entire desktop, move the mouse to the desired image –regardless of screen location–, and issue the appropriate mouse action so you will see what the user sees. Achieve uncompromised testing accuracy: Unlike other test automation solutions, CitraTest® does not modify the operating system of the system under test, or the application code in any way, and has a very small footprint, less than 10 Mbytes of memory. A non- invasive implementation accelerates time to market and ensures testing accuracy, customer satisfaction & peace of mind. Are you ready to increase quality for ALL your applications, realize better value and instant results?